I am officially in love with this series!! The plot is unique and fast-paced, the characters are fantastic, and the romance is ON FIRE. Jennifer L. Armentrout has blown me away with her amazing writing abilities and creativity. I will absolutely be picking up more of her books. Latching onto this story was very effortless for me and I was sucked in from page one by the main character, Katy. Katy's life changes when she meets her next door neighbors, Daemon and Dee. Dee befriends Katy, much to Daemon's dislike, and Katy soon comes to find out that they are not from this planet. Things get even more complicated when Daemon saves Katy's life more than once, which leaves a mark on her that their enemies can trace back to them--putting them all in danger. Katy makes such a great narrator and protagonist: she's sassy, sarcastic, feisty, extremely witty, and overall likable and relatable. Plus, she's a book blogger, and I feel like that's pretty darn awesome! What's also awesome is the undeniable pull between her and Daemon. 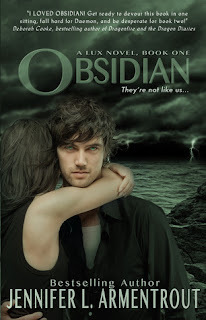 Daemon is mischievous, sly, and so unbelievably smoldering. But yes, he can also be infuriating and a tremendous jerk, but he has his reasons. Does that justify him being mean? No. But Katy can handle her own; she doesn't put up with his shenanigans and she dishes it right back at him. But when Daemon lets his guard down, he can be so sweet and gentlemanly. Plus, he's so protective over Katy and I find that absolutely swoon-worthy! I basically tore through this book pretty quickly because Katy and Daemon's story is completely consuming and I cannot get enough! But I was also very caught up and interested in all of the alien activity and conflict going on in the book. The last few chapters had me so anxious and I was seriously tensed and on the edge of my seat until I finished the book. I can't wait to start reading the next book, Onyx, so I can continue to be surprised and enraptured by these characters! Ahh, wasn't it great? I loved it and I'm so glad you did too!! The second book, Onyx wasn't as good as this one, IMO. I read it awhile ago, and still need to write a review for it :/ Hopefully Opal will compare to this one! Daemon rocks! Yes, I have a serious case of Daemon fever! Haha! I'm reading Onyx right now and I'm liking it so far, but I do feel like Obsidian blew my mind a lot more. Yeah, I'm hoping Opal will be EPIC!